“Songbird Road: Part Two” is a conversation-heavy episode of a show that’s usually strongest when it’s telling its stories through visuals, rather than words. It still works, but I’d say it works despite that choice, not because of it. There’s something that feels very stage-bound about the way characters keep arranging and rearranging themselves into various two-person, subtext-free conversations. Thankfully, the meat of those conversations is interesting enough that it mostly makes up for the clunkiness in getting to them. “Songbird Road: Part Two” is an episode about memory—how we remember our childhoods, how parents intentionally try to create good memories for their kids, and the legacy of memories that are carried on by the people we love after we die. It’s been a long time since This Is Us has used the Big Three’s elementary/middle school years in a way that feels thematically rich, and it’s nice to see that period is still good for something more than just This Is Us comfort food. “Songbird Road: Part Two” offers two parallel storylines in both the past and the present. As Randall and Kate swing by their old neighborhood on their road trip back from Bradford, their younger counterparts spend the day with Jack as he struggles to process his visit with Nicky. Meanwhile, 1980s Rebecca takes Kevin to a sports signing, while in the present day she joins him in Bradford to try to make a connection with Nicky. The Randall/Kate storyline is the weaker half of the episode, mostly because it’s weighed down by too much on-the-nose dialogue. The way they reminisce about “the sequin fight” and “Pearson pizza” feels more like a clunky attempt to replicate cute family shorthand than genuine cute family shorthand. And while the idea of Randall and Kate remembering a single day of their childhood in two very different ways is interesting, the episode is too unsubtle about spelling that out. I don’t think that “show rather than tell” is a hard and fast rule for good storytelling. In this case, however, the image of little Randall silently placing his head on his dad’s shoulder is a million times more effective than adult Randall’s monologue about the difficulties of trying to hide bad days from your kids. 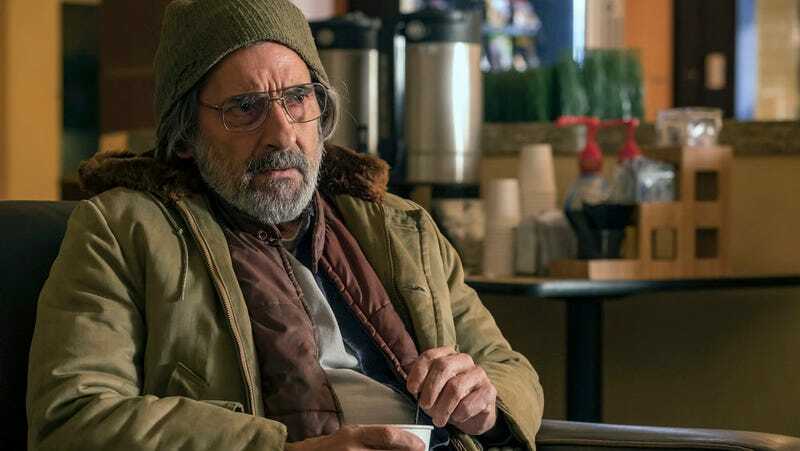 This Is Us has a tendency to wrap up even its most difficult storylines with a neat bow, and I admire the show’s commitment to leaving Nicky’s storyline as a bit of a dangling thread. It’s not unhopeful, exactly. Nicky tells Kevin he’ll attend at least one meeting at the Vet Center. But it’s certainly not a sterling example of the Pearsons’ can-do spirit magically fixing everything either. It’s nice to see This Is Us live in that grey area for once. I’ll be very curious to see how the show handles (or doesn’t handle) Nicky’s existence going forward. If “Songbird Road: Part One” used Nicky’s story as a way to explore Jack, “Part Two” uses Nicky’s story as a way to explore Kevin. And that continues the trend wherein Kevin has unexpectedly become one of This Is Us’ most interesting characters. It’s one of the most remarkable reclamation projects I’ve ever seen on TV. Kevin’s love-triangle-filled first season storylines used to feel like such a hindrance on the series, but after a fairly revelatory exploration of his character in the second season episode “Number One,” This Is Us has continued to build Kevin into the most complex, interesting member of the Big Three. That Kevin’s road to sobriety would involve a relapse isn’t at all surprising (and not just from a dramatic storytelling point of view, relapse is often a part of real-life sobriety journeys as well), but it definitely took me by surprise as a capper to this particular episode. Though Kevin is clearly upset about his inability to “fix” Nicky, Justin Hartley doesn’t play it as the stereotypical driven-to-drink kind of torture, which is a much more effective choice. Kevin is an actor, yet his personal struggles have always tended to be more internal than external. That’s been true ever since he was kid. My favorite part of this whole episode is the flashback storyline about Rebecca taking Kevin to get an autograph from Pittsburg Pirates pitcher John Smiley. Parker Bates remains phenomenal at capturing the way young Kevin’s petulant demeanor hides a sensitive, complex soul. A lot of Kevin’s storylines have been about the way he uses his sports and acting success as a way to find the love and validation he felt he never fully got from his family. This storyline offers a new flipside as well: Kevin’s sense of isolation has also given him a caretaker’s instinct too. He wants to meet John Smiley not just to get his autograph, but also to pass along some well-researched recommendations of pool halls and karate centers in Minneapolis, just in case Smiley gets traded to the Twins. He’s worried about the future happiness of his favorite baseball player, which is sweet and heartbreaking all at once. Kevin’s arc this season has been about tracing his similarities to Jack, but I also think Kevin has inherited so much of Rebecca’s personality too—from her caretaker’s instinct to her anxiety to her tendency to keep her emotions locked away. Little Kevin doesn’t tell his mom about how much research he’s done to help John Smiley, and adult Kevin doesn’t tell his mom about his relapse. As Rebecca explains to Nicky, Kevin is tricky and hard to define. He’s a sensitive soul who doesn’t always feel at peace in the world, which I think speaks to her personality as well, even if she doesn’t necessarily make that connection herself. Several of the Pearsons have expressed concern that Kevin’s quest to dig into his dad’s past could leave him broken if he doesn’t get the answers he wants. The fact that his breakdown happens in secret makes it even scarier than if it happened more dramatically so that his family would at least know to reach out to help him. I’m really intrigued to see Kevin’s arc play out over the course of the rest of the season. First up, however, it’s finally (finally!) time for a Beth Pearson origin story. He doesn’t have that much screentime, but this is a really great episode for Milo Ventimiglia. Particularly in the scene where Jack apologizes for his moodiness and starts the sequin fight, Ventimiglia gives Jack an almost manic edge that makes it clear he’s forcing the cheerfulness rather than organically feeling it. Randall and Kate’s sheer joy at being able to order their own pizza was such a perfectly observed childhood milestone, especially Randall’s over-the-top attempt to pose as an adult while placing the order. On the other hand, Jack’s claim that spinach gives the pizza a “nice crunch” made me question whether anyone on the This Is Us writing staff has ever actually eaten spinach pizza. It’s not generally a crunchy experience. Is there another episode where Kate has a big revelation about potentially misremembering her own childhood? That conversation felt very familiar to me. Randall referring to Deja, Tess, and Annie as Angelica, Eliza, and Peggy was utterly adorable. Because I feel like I didn’t talk about it enough in this review, let me just reiterate that Griffin Dunne is so, so great in this episode.